The launch clashed with the private view of a good artist and a good friend – Peter Seal: Paintings and Collages at Bankley Studios and Gallery, until 27 July, which is coincidentally the duration of Manchester Jazz Festival – but managed to catch two and a quarter of the four bands showcased as Jazz on 3: BBC Introducing, which was recorded for future broadcast at Band on the Wall. We were told how the participating bands were selected (open submission before a panel of experts), but what about the audience? Was the object to find the most accurate representation of the Manchester demographic (i.e. rowdy, and indifferent to jazz)? If so, they succeeded. Of the bands, The Moss Project sounded better than I’ve ever heard them, and I’d like to hear the Peter Edwards Trio again, in a more sympathetic surrounding. With Spellbound Stories, Juliet Kelly (Festival Pavilion) has combed the canon of literature to produce a batch of original songs good enough to grace any modern musical. Thus, ‘Beautiful Smile’ was inspired by Zadie Smith’s White Teeth , and Dorothea, from Middlemarch, gets a lovelorn torch song, ‘Surrender’, and the message of The God of Small Things is condensed to a catchy refrain, “The little things about you / The little things that make me love you.” Kelly herself, cheerful, ingratiating, wholesome and radiant, is set fair to occupy the niche of the Deanna Durbin of jazz. Pigfoot (Festival Pavilion) deconstruct vintage jazz tunes with irrepressible glee and an expertise not often encountered in anarchy. Somehow, the venerable ‘12th Street Rag’ strays into 13/3 time and the melody of ‘Basin Street Blues’ first materialises with Liam Noble plucking bare strings from inside the piano, giving the tune an unaccustomed eerie quality. ‘Jitterbug Waltz’ retains it’s waltz-time, but the harmonic centre shifts vertiginously, until, in the most unexpected of Pigfoot’s transformations, it turns into the fondly remembered Wilson Pickett tune, ‘The Midnight Hour’. There is more shape-shifting during ‘Tennessee Waltz’. “We occasionally cross over to the dark side and play Country and Western,” explains Chris Batchelor. In fact, ‘Tennessee Waltz’ is played surprisingly straight, and is rather touching. Chris Batchelor’s beautifully-toned trumpet provides the emotional core of the music, and prevents it from becoming a mere joke. Can somebody keep that baby quiet? Oh, it’s actually Chris Batchelor fiddling with the mute during ‘Mood Indigo’. Here’s how Pigfoot tackled ‘Just a Closer Walk With Thee’, a spiritual beloved of trad-jazzers. The theme is carried by Oren Marshall’s rocking tuba, buoyed by second-line rhythms from Paul Clarvis. Oren Marshall has the deadpan expression of a Buster Keaton, and the only outward sign of excitement is when he begins to swivel his hips, which is not always easy when balancing an oversize tuba. Marshall’s hips begin to swivel during a passage of counterpoint between tuba and barrelhouse piano, with Noble doing his best James P. Johnson impersonation. Paul Clarvis proceeds to demolish the distance between Baby Dodds and Ginger Baker with a galvanising drum solo. The theme re-emerges. No, not quite. It’s become ‘His Eye is On the Sparrow’, which fits both the genre and the chronology. But Pigfoot aren’t just crazed yahoos. A real love of the music underpins the sacrilegious behaviour, just as technical accomplishment is necessary for such zany excess, and sensitivity is a requirement for complete insanity. Paradox attaches to Pigfoot like barnacles to a reef, as befits the nation’s foremost 21st century acid trad band. Highly motivated, and outrageously talented, Arun Ghosh has established himself as an international figure. But his roots are distinctly Manchester, and homecomings are always events. The line-up of the Arun Ghosh Sextet (Festival Pavilion) includes saxophonist Chris Williams, bassist Liran Donin and tabla-player Nilesh Gulhane, from the group that made A South Asian Suite (the first two are also members of Led Bib), together with some old pals from the Manchester scene, John Ellis and Dave Walsh. It’s instructive to compare Ghosh with the musicians he left behind. Dave Walsh is a genial giant, powering the ensemble in great surges of rhythm and never drawing attention to himself: in short, the quintessential jazz drummer. John Ellis is a graceful and responsive accompanist. His lack of ego makes him the ideal foil for Ghosh, whose inner being is big enough for the entire Sextet. ‘A South Asian Suite’, the attraction mentioned in the advance publicity, incorporates the distinct musical styles of Bangladesh, India, Nepal, Pakistan and Sri Lanka. For example, ‘River Song’, a sweet summons to water, was inspired by the folk music of Bangladesh. Here, Ghosh evokes the ebb and flow of the river, imagines the sights and sounds of fishermen and bathers, and successfully fuses elements of western classicism (notably, his elegant, pure-toned clarinet) with Eastern tonalities and rhythms: the Brahmaputra meets Ma Vlast, if you like. The knowledge that ‘River Song’ was conceived at Chorlton Water Park makes it no less beguiling. Nor is ‘South Asian Suite’ all stately themes and eastern exoticism: ‘The Gypsies of Rajasthan’ is an exhilarating opener and ‘Sufi Stomp’ affirms the transcendent energy of the dervish. In its range and varied moods, ‘A South Asian Suite’ is a major achievement and a defining statement of neo-Indo-Jazz. So far, so sublime. The second half of the concert is something else again. Ostensibly a trawl through Arun’s back-catalogue, the music amounts to a passionate response to recent world conflict and violence. The addition of Jason Singh makes all the difference. A mouth musician and human beat-box (“beats and sound effects,” is Arun’s description), Singh conveys a purely human response on a purely human instrument (the voice), and imitates sirens and the tools of war to heighten the urgency of the sadly topical ‘Intifada’. ‘The Indian Fort’, inspired by Bismillah Khan ushering in Indian Independence on shehnai in 1947 atop Delhi’s Red Fort, tilts more towards the despair of Partition than the hope of Independence. Chris Williams stretches out on this one, adding pain-wracked cries to the tumult. ‘Longsight Lagoon’ banishes exoticism with modern urbanity: innocence is briefly restored with ‘Uterine’, a celebration of motherhood, with suitable whooshing and liquid sounds from Singh. Quite appropriately, this is not at all gentle towards the climax. The Arun Ghosh Sextet received a standing ovation: how often does that happen? Further evidence of Arun’s ability to channel rock ’n’ roll power comes with the encore, a bona fide Manchester anthem in the shape of James’ ‘Come Home’. I took the day off, to help a friend move house. Ellis has a gift for discovering and nurturing unknown talent. This often takes a practical form, as a prolific sound recordist with his own home studio. His musical skills, meanwhile, make him the ideal accompanist. He can be relied upon to enhance the proceedings without dominating them. This rare mix of selflessness and searching makes him an invaluable supporter of little-known songs and little-known songwriters. Ellis is that rare thing: a jazzman susceptible to song. I’m not saying that a practical knowledge of the symmetry of diminished scale harmony and an appreciation of the well-turned phrase that cuts to the heart of the human condition are mutually incompatible objectives, just that most of us tend to put them into separate compartments and, as is only natural, as one compartment grows, the other might shrink. John Ellis, however, keeps his antennae open to both. Who knows ‘Johnny and June’ (by Wayne McDonald, if I got the name right)? Yet it was unforgettable for its humanity and tenderness in Ellis’ thoughtful, sensitive interpretation. The song also illustrates John’s unspoken theme, which is the tangible presence of love in everyday lives: Linda Womack’s ‘I Am Love’ is his opening song. Of course, the journey to selfhood is frequently obstructed by all kinds of ennui and negativity. Ellis’ world-view is deepened by darker feelings. To hear him sing ‘Norwegian Wood’ is to appreciate the oddity of John Lennon’s psyche. The fatalism of Ellis’ own ‘Life Will Be the Death of You’ is leavened by wry humour. At such times one looks to the swinging, funky, soulful piano to grasp the life-affirming message. There seems to be more for the musicians of the Trio to do this time (last year, at Bridgewater Hall, Ellis seemed literally to be plucking the songs out of empty air). Drummer Rob Turner is a matchlessly discreet patterer on these occasions, and bassist Pete Turner too, is a sympathetic and intelligent partner. In fact, someone told me that he holds down a day job as a nuclear physicist, which is one of those little surprises that seem to surround John Ellis. No satirical intent is discernible in the solo piano recital by Adam Fairhall at St Ann’s Church, just a deep reverence and knowledge of jazz history. His highly personal synthesis carries the techniques of stride and harlem piano over to the far more rigorous sphere of free jazz. ‘I’m Getting Sentimental Over You’, the opener, nods to Duke Ellington and Art Tatum, and is rich and fulsome enough to please any swing lover. The improvisation that follows could be an extended variation on ‘I’m Getting Sentimental Over You’, albeit with oblique harmonies and fugitive tonality. The virtuosity persists when he moves to the Dulcitone, a small, century-old, portable piano which (he said) was suitable for the sacred space as it was a commonplace in places of worship too poor to have their own instrument. It emits a cushioned, dulcet rumble, as Fairhall crafts lines of meshing rhythms, with a different time signature for each hand. ‘Egyptian Fantasy’ doesn’t quite go to the extremes of deconstruction favoured by Pigfoot, but it does show how fearlessly Fairhall reaches backwards and forwards in time for ideas. He is also unafraid to experiment in front of an audience, which is a profound asset. Svarc Hanley Longhawn (Matt and Phred’s), a guitar driven jazz-rock trio on the model of Tony Williams’ Lifetime, are… interminable. 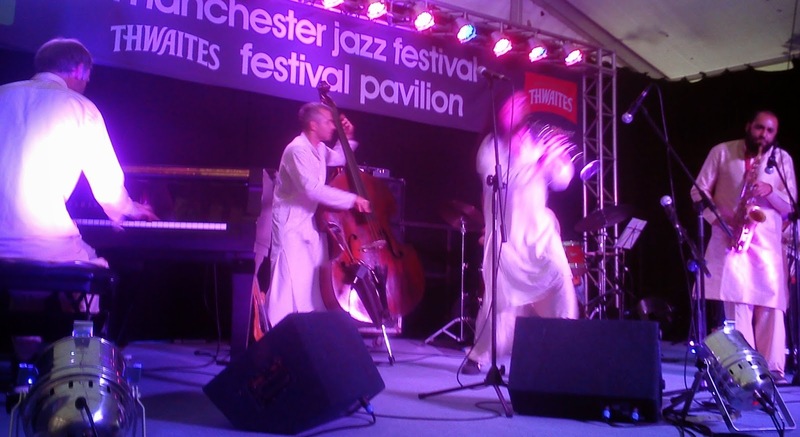 0 Responses to "Manchester Jazz Festival Pt 1 Fri 18-Mon 21 July 2014, with Pigfoot, Arun Ghosh, John Ellis and Adam Fairhall "